Gasser’s are easily spotted from a mile away.Â The body’s are lifted up with a straight axle highly visible in the front.Â In the early 60’s that is what everybody brought to the local drag strips.Â Back then you didn’t care about pro-touring handling, you just wanted something to go lickity split for a quarter of a mile. 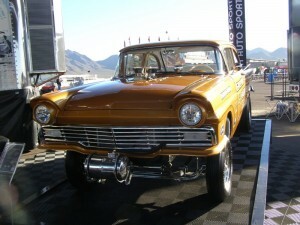 The latest issue of Hot Rod magazine (December, 2013) has an article on a 58 Ford Gasser that the folks at Galpin Ford did for a sales manager, Steve Carpenter.Â The article is a nice write-up on a nice car. The 331 cubic inch Ford engine produces 500 horsepower and matches up to a Borg Warner 4 speed, using a Hurst 4 speed.Â Â Â A Currie 9 inch rear end with a 4.11 posi helps hold everything together.Â Â Lots of chrome, which probably wasn’t in use as much back at the old airstrip dragways, is evident.Â That’s a nice gold pearl paint job with real gold and silver leaf lettering. We first saw it at the Barrett-Jackson Auction in January 2013 in Scottsdale, Arizona and thought we could share some extra views of this gasser for our readers. Galpin Ford has a solid reputation for doing cars right, and just previewed a supercar at Pebble Beach.Â Here’s hoping that both cars will be at their booth in Las Vegas next month at the SEMA Show.